Some progress happened last night and this evening so your faithful corespondent is here to tell you all about it 😉 No drama though, it all went very smoothly. I started by checking out the neck, adjusting the truss rod so that it is perfectly flat. 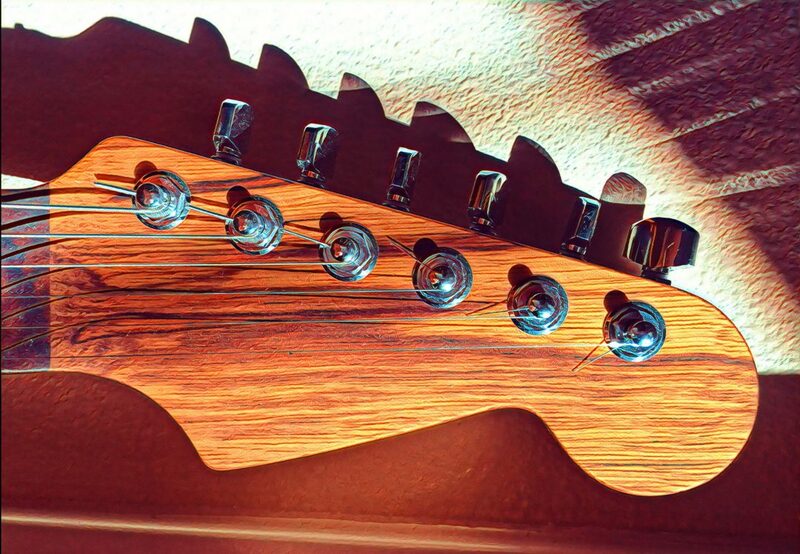 Warmoth necks come with some string relief built in so they usually need to be adjusted. I did this by setting a straightedge along the neck, with the ends at the first and 22nd fret. Then I looked in the middle of the neck. This is what I saw. So I started adjusting the gross truss rod adjuster until the neck was flat, a 1/4 turn at a time. Here is the straight neck, same view as before. The next time I adjust neck bow will be after it is mounted, strung to pitch, and measured. The way that will work is using the Gotoh side adjuster which comes in Modern Warmoth necks. Here is a shot of a different neck I used on a different guitar, just meant to show the side adjuster for the truss rod. By the way, this is a most excellent mod! Next I moved on to the wiring and I finished wiring the internals. Finally, I installed the bridge and the neck pickup ring. Here is a shot of how things are looking – the neck is not yet bolted on. That’s a Gotoh Tele bridge and it is a nice piece! Heavy, solid, exacting. I’m still not sure I like this neck on this guitar. Sometimes I think it looks cool, sometimes I think it clashes. It’s a maple neck with an ebony fretboard and it is beautiful on its own, I’m just not yet sure about this guitar. Hmmm. Anyway, the next steps will be to install the tuning machines on the neck, bolt the neck to the guitar, string it, and do the basic setup. When that is done, I’ll test the electronics and wiring. And post some more photos. Another time.